特別セミナー「国際協力を仕事として」を開催しました/Special Seminar on "International Cooperation as a job"was held. The special seminar for the course students was held on February 9th, 2016. 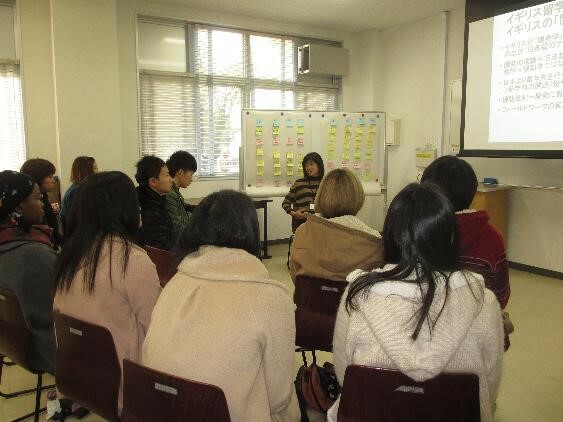 We invited Mrs. Mikiko TSURUI, international development consultant, as lecturer. She talked about her experiences mainly on study abroad in England, JOCV (Japan Overseas Cooperation Volunteer) in Nepal, career path after JOCV, and work-life balances. At the end of her lecture, she gave some advice to the students about what kind of preparation they need to do while they are at the university. The seminar was a great opportunity for them to reconsider what they should do in order to spend the rest of their university life more efficient and successful. The seminar was followed by an ethnic lunch where participants, lecturer and teachers from the course could further discuss about that day's topic.